There are following some steps to create Spring application as given below. Step2. 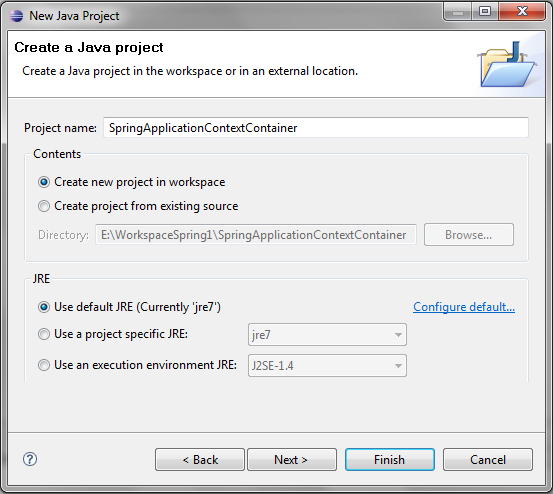 Now add spring jar in your project, To do this, right click on your project name SpringBeanContainer and then follow the following option available in context menu: Build Path -> Configure Build Path to display the Java Build Path window as given below. 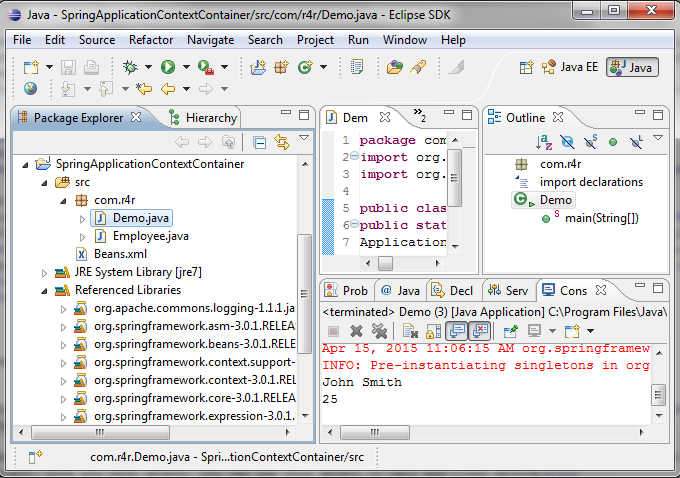 There are mainly three jar files required to run this application, To load the jar files in eclipse IDE, Right click on your project - Build Path - Add external archives - select all the required jar files - finish. Employee is simple bean class, containing only two property name and age with its getters and setters method. The name and age of the employee will be provided by the xml file. Step4. Now create the xml file click on src- new -file -give the file name like Beans.xml then finish. The bean element is used to define the bean for the given class. The property subelement of bean specifies the property of the Employee class named name and age. The value specified in the property element will be set in the Employee class object by the IOC container. Step5.Now Create the java Main class(Demo.java), Here we are getting the object of Employee class from the IOC container using the getBean() method of BeanFactory. First step is to create factory object where we used framework API FileSystemXmlApplicationContext () to create the factory bean after loading the bean configuration file from the given path. Second step is used to get required bean using getBean() method of the created context. This method uses bean ID to return a generic object which finally can be casted to actual object. Once you have object, you can use this object to call any class method.